Today officials announced Adjaye Associates and Ron Arad Architects as the winners of an international competition to design a Holocaust memorial in London. 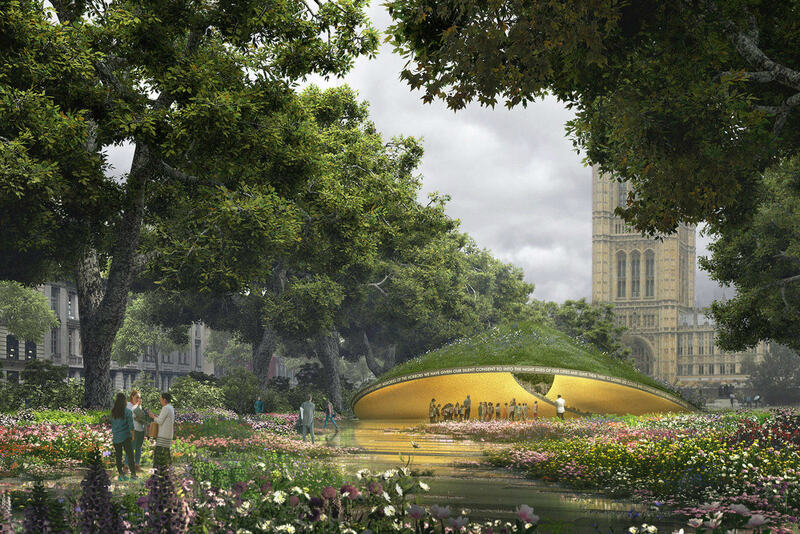 The project, officially known as the Holocaust Memorial and Learning Centre, will honor the memory of the six million Jews murdered in the Holocaust, as well as the Roma, gay, and disabled people who were killed by the Nazis. 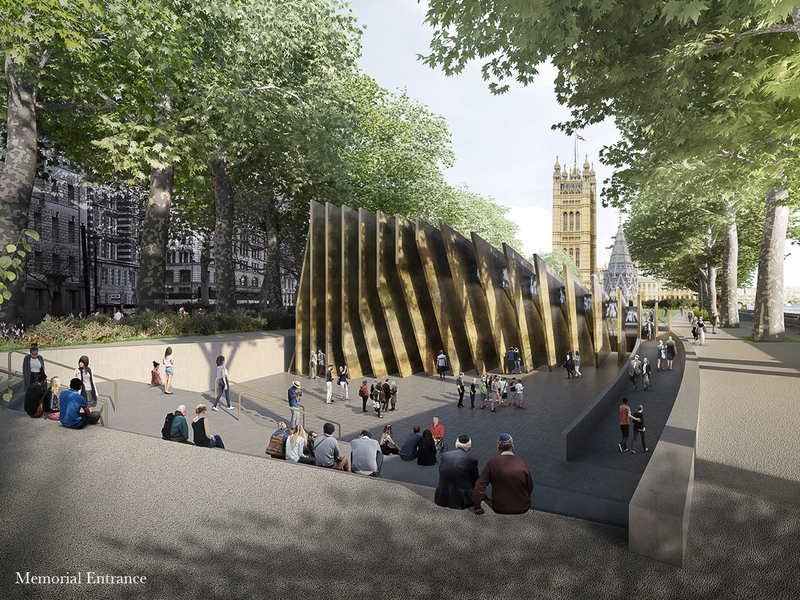 Elected officials, rabbis, Holocaust survivors and their descendants presided over the design unveiling for the memorial and learning space, which will sit at the southern end of Victoria Tower Gardens, right next to the Houses of Parliament. The spaces will encourage reflection and understanding by educating visitors on the Holocaust and antisemitism and in turn using this understanding to explore other forms of hatred, such as Islamophobia and homophobia, as well as examine institutions' role in preventing hatred. The idea for a new memorial and education center was first floated in January 2015, following a survey that found growing public ignorance of the Holocaust and dissatisfaction with the memorial in Hyde Park. The design competition launched the following year, in September, and the ten finalists were announced this February. The labyrinthine design is meant to encourage individual reflection. At the end of each pathway, 23 tall bronze fins representing the 22 countries of origin of Jewish Holocaust victims will face visitors, who will enter the chamber alone. The routes eventually funnel into the contemplative Threshold. This segues into the underground Learning Centre, which includes a space where survivors' stories are shared, as well as reflective chamber with eight bronze panels which will be called the "Contemplation Court." “The complexity of the Holocaust story, including the British context, is a series of layers that have become hidden by time," said Sir David Adjaye, principal of Adjaye Associates, in a prepared statement. "Our approach to the project has been to reveal these layers and not let them remain buried under history. To do so, we wanted to create a living place, not just a monument to something of the past. We wanted to orchestrate an experience that reminds us of the fragility and constant strife for a more equitable world." The memorial is Adjaye Associates' latest high-profile public commission. In the U.S., the firm is best known for designing The National Museum of African American History and Culture in D.C., and it was just tapped to design an interactive spy museum in New York. The building's siting was meant to provoke intrigue from afar. On the approach, visitors will see the memorial's fins just over a green landform. The structure dialogues with a likeness of Emmeline Pankhurst and the Burghers of Calais, as well as the Buxton Memorial, three other statues and sites that interrogate injustice. Gustafson Porter + Bowman is collaborating with Adjaye and Arad on the landscape design.